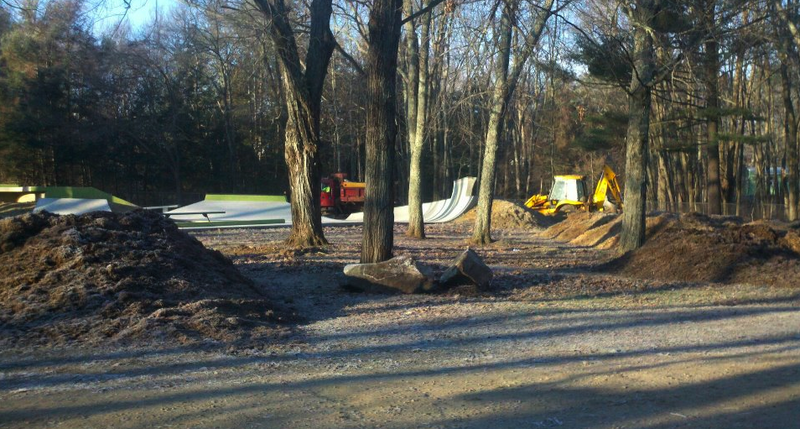 I was out the door into 28 degree temps to go ride the new Willimantic Skatepark bright and early Tuesday. 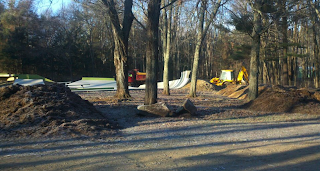 I arrived at the park around 9 and there were dirt piles everywhere along with a backhoe and some dump trucks. I thought nothing of the guys working and went to grab my bike. No sooner than my tires touched the ground I get hollered at by one of the dump truck operators. I made my way over to hear him out and wasn't psyched to hear, "Parks closed until Spring. Can't ride here." Awesome! So I dragged myself out of bed and braved the frost to get shut out...what a drag! Fortunately, the Fat Trax guys I was supposed to meet up with still had motivation and upon calling them they said we should make our way to the Dayville Park. It ended up being a fun,brisk session after all. Once the sun was high in the sky the 30 degree temps weren't that bad. Hello Winter!